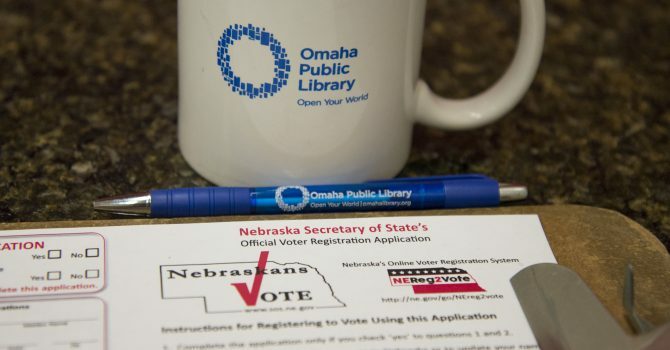 Election Day is on Tuesday, Nov. 6, and Omaha Public Library is ready to help eligible Nebraska residents register to vote and get information about the upcoming election. Eligible Nebraska residentsopens a new window can register to vote at any OPL location through Friday, Oct. 19. Important note: To vote in the Nov. 6 general election, Nebraskans must register to vote by Oct. 26. Any registrations between Oct. 20-26 must be done in person at the Douglas County Election Commissionopens a new window. Four Omaha Public Library locations — Bess Johnson Elkhorn Branchopens a new window, Charles B. Washington Branchopens a new window, Milton R. Abrahams Branchopens a new window and South Omaha Libraryopens a new window — have Early Voting Drop Boxesopens a new window available. Learn about the candidates running for office using the League of Women Voters of Greater Omaha's nonpartisan 2018 Voters' Guideopens a new window—print copies will soon be available in all OPL branches. Nebraska voters should reregister to vote every time they move, change their name, or want to change their party affiliation. Not sure which party you're registered with? Check online using Nebraska VoterCheckopens a new window, which will also tell you which legislative districts you live in based on your address. Nebraska residents with a valid NE driver's license can register to vote onlineopens a new window. The Douglas County Election Commission has a Voter Instructionsopens a new window document that provides a step-by-step guide for new voters. You can also use the "Find Your Voting Information" field on the website to learn where your polling place will be. Registered voters can request that an Early Votingopens a new window ballot be mailed directly to them prior to each election, or they can visit the Election Commission and vote early in person. View a personalized sample ballot by entering your home address at vote411.org/ballotopens a new window. If you need assistance sorting out your registration information, visit an OPL branch as soon as possible. Our friendly staff will help all eligible voters gain access to the ballot box this November.